This exquisite needlepoint lace collar, made in Youghal, Co. Cork and exhibited at the Royal Dublin Society in August 1906, epitomises one of the more remarkable achievements of Irish women in the second half of the nineteenth century—the creation from scratch of a world-class craft industry. In 1847 a nun at the Presentation convent in Youghal, Mary Anne Smith, ‘conceived the idea of getting up some kind of industrial occupation amongst the poor children attending the convent school such as would help them to earn a livelihood or, at least, keep them from starving’. 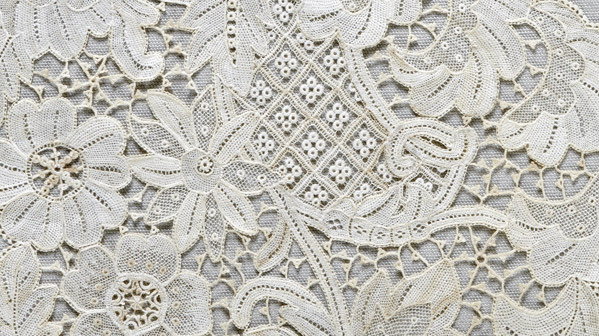 Smith found a piece of antique Italian point lace and was struck by the idea that lace-making was a potentially lucrative activity that needed little in the way of initial capital. She unravelled the Italian lace, worked out its complex patterns and began to teach the techniques to those of her pupils most adept at needlework. Youghal needlepoint lace was marked by the Italianate techniques developed by Smith, and evident in this floral collar: flat cotton stitching made with fibre thinner than human hair, motifs surrounded by shell stitches (seven tiny stitches on each loop). But the Youghal women also developed 50 new stitches. They had to combine inventiveness with finesse to compete in a market flooded by machine-made lace. Irish laces were a niche product for the well-to-do, and their attractions were greatly enhanced by the cachet of the Arts and Crafts movement of the nineteenth century. Irish laces quickly became high fashion, worn by everyone from the Pope to Queen Victoria. In 1886 a large quilt of needlepoint lace made at Kenmare was sold to an American millionairess for the then-staggering sum of £300. The industry spread outwards from the convents, although commercial lace production in Limerick and Carrickmacross had developed at an earlier period; each type of lace-making had its own distinctive style and techniques. Lace design was taught and developed at colleges, notably Cork’s Crawford School of Art; Irish designers such as Michael Hayes and Eileen O’Donoghue, from Limerick, helped to create styles that appealed to an international market. Young women did not make fortunes from these delicate skills—eighteen shillings a week was regarded as top earnings for a diligent lacemaker. Nevertheless, these earnings were highly significant in households with very limited incomes. They gave young women a degree of economic value and independence they would not otherwise have enjoyed. An irony of Irish life was that many young women used their savings from lace-making to buy tickets to America.